attachment device; welded to a steel tank; or hooked over a secured supporting member. The brackets must be spaced no more than 8-feet apart. No more than two persons should be on any 8-foot section at one time. Tools and materials used on the scaffold should not exceed 75 pounds. The platform is built of at least two 2- by 10-inch nominal size planks. 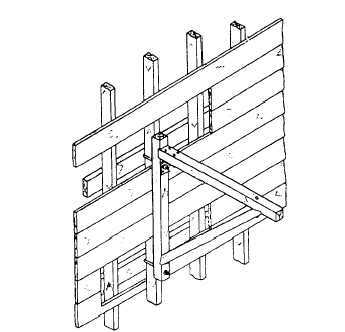 The planks should extend between 6 and 12 inches beyond each support. When working on scaffolding or tending others on scaffolding, you must observe all safety precautions. Builder petty officers must not only observe the safety precautions themselves, but they must also issue them to their crew and ensure that the crew observes them. Figure 4-46. - Carpenter's portable bracket for scaffolding. Although the following references were current when this TRAMAN was published, their continued currency cannot be assured. You therefore need to ensure that you are studying the latest revisions. Navy Occupational Safety and Health (NAVOSH) Program Manual for Forces Afloat, Volume I, Office of the Chief of Naval Operations (OP-45), Washington, D.C., 1989. Safety and Health Requirements Manual, E M 385-1-1, U.S. Army Corps of Engineers, Washington, D.C. 1981.